Why Are Black Communities Disproportionately Effected By Air Pollution? Systematic oppression comes in many forms, not just the usual job discrimination and lower wages most people hear about. There are more dangerous forms of oppression; such as environmental racism. It is not a coincidence that so many black communities are located in close proximity to power plants or near oil refineries. Large corporations have a long history of preying on poorer communities because of the lack of political power they hold. 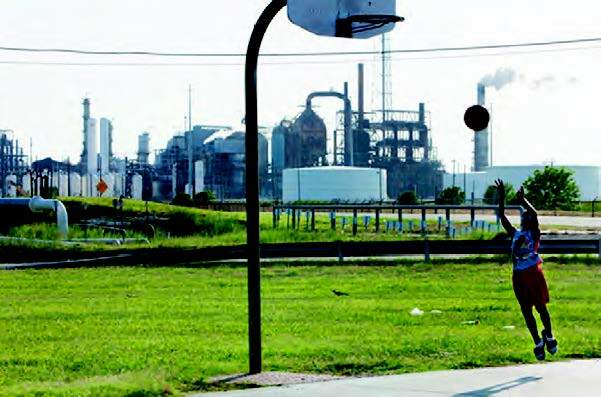 A new study released Tuesday by the advocacy group Clean Air Task Force (CATF) and the NAACP reported that African-Americans are disproportionately affected by health problems associated with air pollution from oil refineries. According to the study, more than 1 million African-Americans live within half a mile from an oil and gas refinery, while roughly 14% of the black population live in a county with an oil operation. Considering the fact that black Americans make up only about 14% of the U.S population shows that black communities have a higher risk of being impacted by pollution-related health conditions versus other racial groups and according to the study that number is growing each year. For example, Houston and Dallas have the highest risk of childhood asthma related to ozone smog; a by-product of oil and gas facilities. Texas, Ohio, California, Louisiana, Pennsylvania, and Oklahoma have the largest share of African-American citizens living within areas the Environmental Protection Agency (EPA) considers high-risk zones. These are areas within half a mile of active oil processing plants. The study also expressed concern for black communities as far away as Chicago, D.C., and New York City that are affected by the pollution of oil refineries carried by the wind. Black communities are more apt to be exposed to toxins in the air like benzene, sulfur dioxide, and formaldehyde; which have all been linked to elevated risks of cancer, asthma, and endocrine disrupting illnesses. African American children were reported to have been affected by 138,000 asthma attacks resulting in 101,000 lost school days each year. Another 2017 study by the American Lung Association reported that in 2015 people in Baltimore experienced 89 days of elevated smog, and on 20 of those days it was at unhealthy levels, increasing the risk of premature death, asthma attacks, and other adverse health impacts. African Americans account for 63 % of Baltimore's population. Get involved in the fight to rid populated areas of hazardous oil facilities. To find out if your community is located near oil and gas facilities go to www.oilandgasthreatmap.com and visit www.methanefacts.org to learn how you can join organizations fighting for a healthier environment. Read the full report titled Fumes Across the Fence-Line.